1620s House and Garden01455 290429work Historic HouseStep back in time to explore this early 17th century house and its gardens and see how people lived 400 years ago. This rare and beautiful house is a surviving example of a family home built in the 13th century and then modernised in 1618. The house has been home to many families over its 700 year history, but the Digby family, which included the Gunpowder plotter Sir Everard Digby, lived in the house for over two hundred years. It is towards the end of the Digby ownership that the newly refurbished house is focused, showing how people lived in late Elizabethan and early Jacobean times. Visitors can now see restored rooms and displays, as well as talk to our volunteers about the history of the house, the families that lived here and about life in the 1620s. 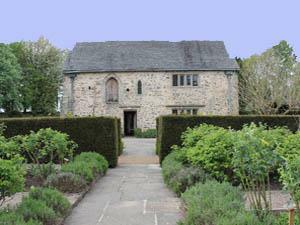 The house is set in beautiful 17th century style gardens with labelled plants and flowers, an orchard, herb gardens and a maze. Visitors can also enjoy light refreshments at the Old Barn Coffee Shop where a range of merchandise is also available. The site will continue its lively series of events that use re-enactment, crafts, hands-on activities, drama and specialist demonstrations to interpret the history of the site and life at the time. A perfect day out for couples, friends, families and groups. Tickets are valid for multiple visits through the open season – tickets must be retained for this offer. Situated in the village of Donington le Heath just outside Hugglescote near to Coalville.